Classroom norms are critical when setting up expected behaviors in a classroom. Taking time to set up classroom norms in a collaborative way with your students will help everyone understand what is expected of them prior to, during, and following learning sessions. What do students expect of the teacher? What do students expect of their peers? What does the teacher expect of students? Give the students time to answer each of these questions. One great method is to write the three questions on the board, and then have students shout out their ideas for each question. Once you have several answers to each question, you can make additions to any category if you think something important has been overlooked. 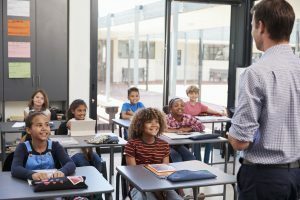 Although different groups of students often come up with very different classroom norms, this actually helps to customize classroom norms to each unique group of students. The teacher always has the final say, and can ensure that basic rules of etiquette are in place. Once classroom norms have been created, it is a good idea to post these in the classroom, or in the online environment if appropriate. Creating classroom norms is a great way to get everyone on the same page as far as what is and is not acceptable behavior during your face-to-face time together. Check back next Friday for Part 2, which focuses on classroom norms for virtual meetings.